Lynn County Hospital was designated by Medicare as a Critical Access Hospital in 2004. Medicare treats Critical Access Hospitals differently than any other type of hospital. They reimburse these hospitals 101% of their costs for taking care of Medicare patients. The majority of patients at Lynn County Hospital are Medicare patients. Our mix of inpatients is usually between 70 and 80 percent Medicare. Medicare uses this number to calculate their reimbursement to us. As an example using a 75% mix of Medicare, for a nurse making $10,000, the Medicare portion of her salary would be $7,500. Medicare would then reimburse us 101% of this, or $7,575 for her services. Most departments of the hospital are reimbursed this way, but not all. Lynnwood is not reimbursed at all by Medicare. EMS, Tahoka Drug and the Specialty Clinic are reimbursed by a different method. The Family Wellness Clinic, which Medicare designated a Rural Health Clinic in 2014, is reimbursed similarly to the hospital. Lynn County Hospital spends a lot of time and energy analyzing the anticipated spending for the above reasons. If an expenditure falls into a department that is “reimbursable”, the decision is made a little easier because we know that Medicare will give us most of our money back within a few months. If it is a capital expenditure, like expensive equipment or buildings, this becomes a little more complicated. Medicare will still reimburse our expense, but it will be spread out over the life of the equipment or building as depreciation. They will also reimburse the interest expense incurred on any debt for these expenditures. As an example of this, on a $12 million dollar loan for 25 years at 6.75%, the annual debt service would be $1,076,575. The annual interest and depreciation costs reimbursable by Medicare would total $1,206,072. At our 75% Medicare utilization rate, Medicare would reimburse us $904,554 yearly, leaving the hospital to pay only $301,518 per year, or just a little over $25,000 per month. This example came from a presentation by New Light Healthcare at a North West Texas Hospital Association meeting. Thank you to everyone who so generously donated to the Billy Tomlinson 35th Memorial Hospital benefit auction sponsored by the Tahoka Rotary Club and generous grants given to make this purchase. We are excited about having the best possible lifesaving equipment for the residents of Lynn County and the surrounding communities. LCHD EMS staff is proud to announce that we received the Local Projects Grant from the State for $19,845 to purchase 3 new Zoll e-series Monitors for our trucks and 3 new Engle EMS fridge/freezer. EMS Director John Baker states upgrading the portable cardiac monitors to the new Zoll “E” series monitors that include end-tidal CO2 monitoring with waveform capnography is the ‘gold standard’ in patient monitoring. The Hospital also purchased two of the same monitors for the emergency room in order to maintain congruency throughout care. The new refrigerators allow us to utilize hypothermic treatment on cardiac patients. 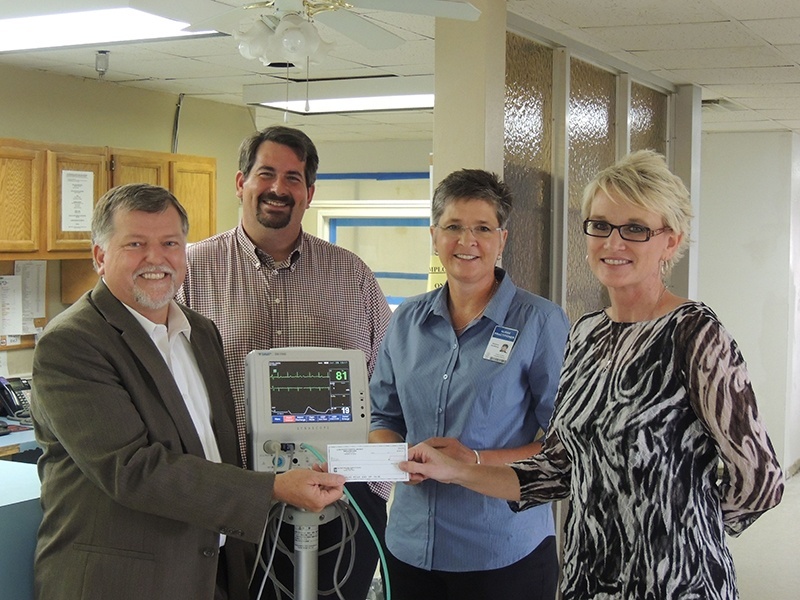 Lynn County Hospital District is pleased to announce the purchase of a new Telemetry System and new Mobile Vital Signs units for nursing. The new Telemetry System will help patients who are at risk of abnormal heart activity. These patients are outfitted with measuring, recording and transmitting devices. A data log can be useful in diagnosis of the patient’s condition by doctors. An alerting function can alert nurses if the patient is suffering from an acute (or dangerous) condition. The new Mobile Vital Signs units add to the ever expanding technology at LCHD. The new Mobile Units track heart beat, blood pressure and other signs vital to human health.